Latest Version: 3.5 Released on Dec 16 2018. Free PDF to Word converter uses an accurate & fast software technology to converting PDF documents into editable Microsoft Word Document (docx, doc, rtf) formats, using an amazing cloud-based artificial intelligence on your Windows desktop. Free download available. 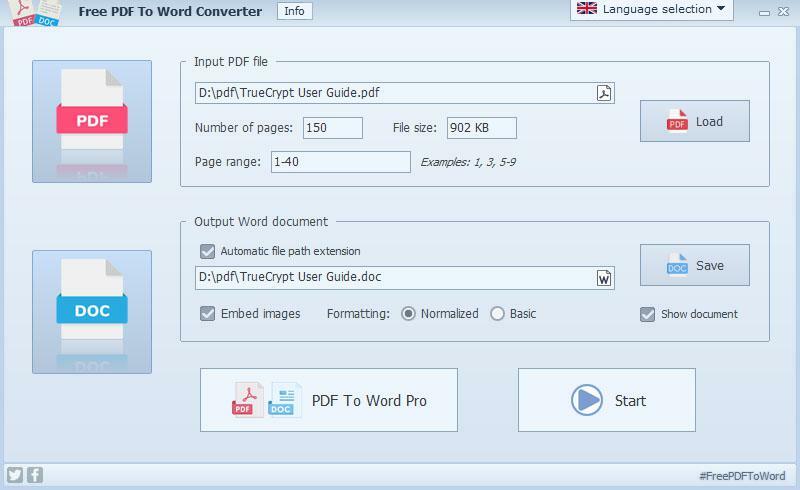 This Free PDF To Word Converter uses our proprietary conversion engine to detect content in PDF files. This freeware conversion utility can handle images in PDF documents and also supports UTF-encoded text content. The created Word document is fully formatted and easily editable. Free PDF To Word Converter is a standalone windows desktop application, that it doesn't require any third-party software to be installed on your computer. Free PDF To Word Converter is a simple, easy-to-use and fast conversion tool for free PDF to Word conversion. You don't need any software skills to use this application. Try it yourself! Basically it is a free demonstration version of FM PDF To Word Converter Pro PDF to Word batch conversion software. Let's see and simply click on free Video Tutorial on the sidebar to see how this great free PDF to Word converter works! 100% FREE usage for any use in any environment for business, home etc. This completely free PDF to Word converter is a very popular and powerful freeware application for intelligently convert PDF files to easily editable Microsoft Word DOCX, DOC and RTF documents. The application uses a cloud-based artificial intelligence and a very fast proprietary conversion engine. What are you waiting for? Just click on download, install it with a few clicks and use it free! Is there an accurate, fast and free PDF to Word document converter?